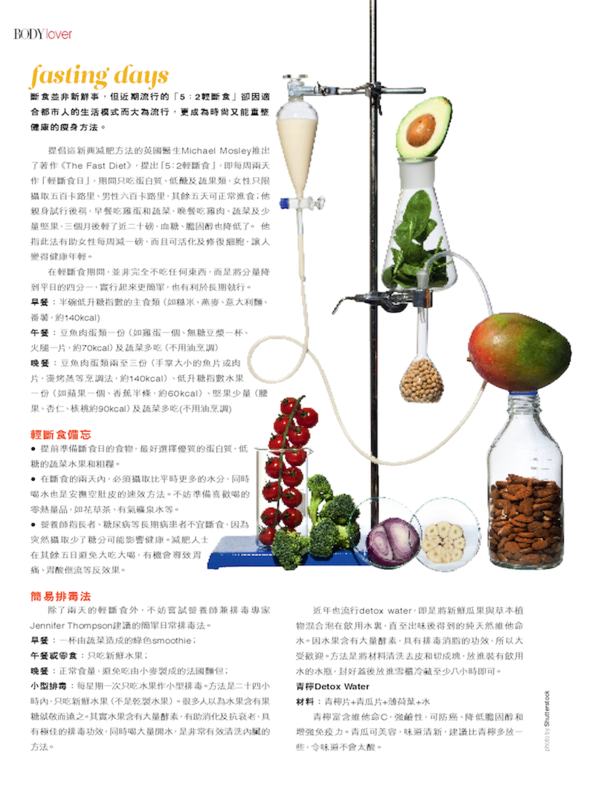 This article was featured in the June 2014 edition of Cosmopolitan Magazine for Hong Kong. 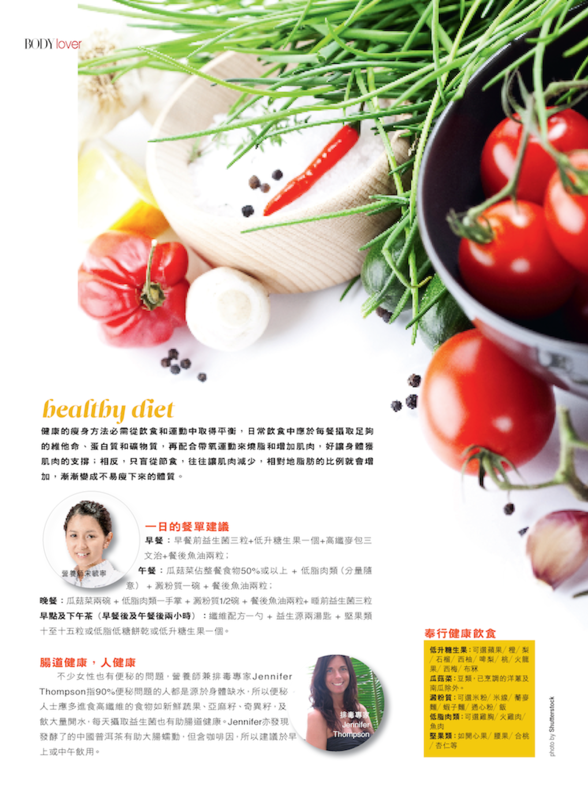 In the article, Sharon Chow asks me questions about slimming, weight loss and detox. Q: For women who have big tummy and water retention problems, how would you suggest their diet and detox method? A: To deflate the tire tummy, you have to ditch the wheat. If you don’t believe me, read the book Wheat Belly by William Davis, and you’ll definitely think twice before reaching for that morning toast or lunchtime focaccia sandwich. Other foods that increase belly fat and water retention are refined sugar and alcohol. To reduce your puffiness (especially in the face, ankles and arms), increase anti-inflammatory foods like ginger, turmeric, fennel and dark leafy green vegetables. Q: For women who wanna lose weight healthy, what kinds of food would you suggest and how to change their ways of lifestyle? A: Don’t make the most common mistake that women make and that is to label fruit as the enemy for fear of eating too much sugar, yet continue to eat chocolate and drink alcohol on a daily basis. No wonder why the scale doesn’t budge! Fruit is not the sugar enemy; in fact, fruit is extremely cleansing, full of enzymes that help digestion and anti-aging anti-oxidants that are great for your skin. Alcohol, on the other hand, is liquid sugar and chocolate, well you should know better! Q: Should we take supplements e.g. vitamins or minerals in order to complement our diet? A: It really depends what type of diet you eat and whether or not you have any health conditions. If you’re vegetarian or vegan, you should take a B12 supplement and have a good source of omega 3 fatty acids, like chia seeds and flaxseed. For good brain health, it’s important to take selenium or eat walnuts and brazil nuts regularly. Protect yourself from city pollution by adding extra superfoods like acai powder, goji berries, bee pollen, royal jelly, spirulina, and chlorella to your diet. Q: For women who have constipation and digestive problem, any detox methods are good for them? A: To find relief from constipation, increase high fiber foods like fresh fruit, vegetables, ground flaxseed and chia seeds and drink plenty of water (90% of constipation is caused by dehydration). Take a daily probiotic capsule containing good bacteria at night before bed for good gut health. I personally find the fermented Chinese pu’erh tea to be excellent for getting the bowel moving but it does contain caffeine, so it’s best to drink in the morning or early afternoon. Q: Can you share your cases which are about weight loss and detox? A: The real success stories I see are with my clients who make long-term lifestyle changes. It has to be a balance between eating well, exercising and de-stressing, but also forgiving, loving and letting go. But, if you make the effort, you can see reversal of digestive problems, skin rashes, depression, anxiety, infertility, fatigue, insomnia, arthritis, polycystic ovaries, fibroids, hair loss, migraine headaches, blood sugar imbalance, weight gain, and more. My goal with my health coaching clients is take have them waking up every day, looking in the mirror and liking who they see. Q: Can you suggest simple and easy detox methods? A: A simple, easy detox and weight loss plan is to drink a green smoothie for breakfast, eat only fresh whole fruit for snacks and lunch, and then enjoy a normal meal at dinner, without the French bread of course. Once a week, do a fruit only day as a mini-cleanse. For 24 hours, eat only fresh fruit (no dried fruit) and drink plenty of water. That’s a great reset button to clean out your colon and get you focused back on good foods for another healthy week ahead. Battle of the Blenders – Which one is BEST?